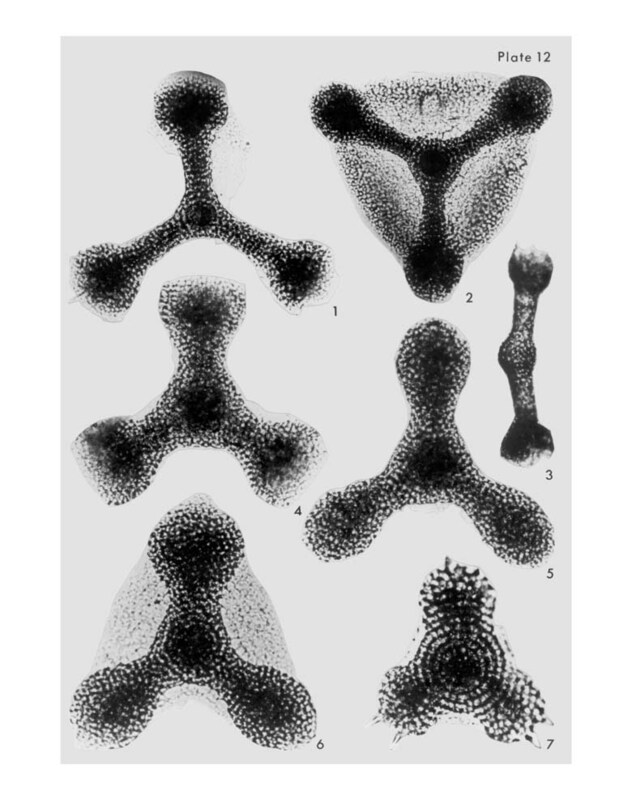 1-3 Hymeniastrum euclidis (Haeckel) Popofsky; 1, patagium rudimentary, VS-R-34a, 3-5cm, E5/0, 200x; 2, VS-R-46b, 1-3cm, U54/0, 200x; 3, edge view illustrating the concentric shells of the central region, VS-R-27b, 1-3cm, D18/3, 200x. 4-6 Hymeniastrum koellikeri Haeckel; 4, patagium absent, arm terminations incomplete, VS-R-27b, 1-3cm, Z53/1, 300x; 5, patagium absent, VS-R-71a, 1-3cm, V40/0, 300x; 6, VS-R-60b, 3-5cm, T20/2, 300x. 7 Euchitonia cf. echinata Haeckel; incomplete specimen, VS-R-34a, 3-5cm, Y26/1, 300x.